Thermosetting plastics are a distinct category of plastics whose high performance, durability and reliability at high temperatures makes them suitable for specialty applications ranging from automotive and aerospace through to electronic packaging and consumer products (your melamine kitchen worktop is a thermoset resin!). Recent developments in thermoset plastics technology and processes has broadened their use exponentially over recent years, and these developments continue: in November 2011, French scientists created a new lightweight thermoset that is as strong and stable as previous materials yet can be easily reworked and reshaped when heated which makes it unique amongst thermosets and allows for repair and recycling. 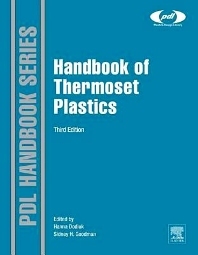 The Handbook of Thermoset Plastics, now in its Third edition, provides a comprehensive survey of the chemical processes, manufacturing techniques and design properties of each polymer, along with their applications. Written by a team of highly experienced practitioners, the practical implications of using thermoset plastics are presented – both their strengths and weaknesses. The data and descriptions presented here enable engineers, scientists and technicians to form judgments and take action on the basis of informed analysis. The aim of the book is to help the reader to make the right decision and take the correct action – avoiding the pitfalls the authors’ experience has uncovered.